This stunning home is located in the prestigious gated community of West Haven at Champions Gate. The area boasts 2 PGA Golf courses designed by Greg Norman and is only 10 minutes from Disney World. This property is the ideal home for your next Florida vacation – offering modern furnishings, high spec equipment, plenty of space and an excellent location. There is fun for all the family with our game room and PS4. Enjoy the community facilies too which include a pool, tennis courts and childrens play area. This stunning home is located in the Prestigious Gated community of West Haven at Champions Gate with 2 PGA Golf courses designed by Greg Norman and 9 minutes from the main gates of Disney World. The 3900 Sq ft villa is ultra modern with all the latest technology and all the comforts of home. Pool villa with FREE pool heat using solar panels to heat the water! 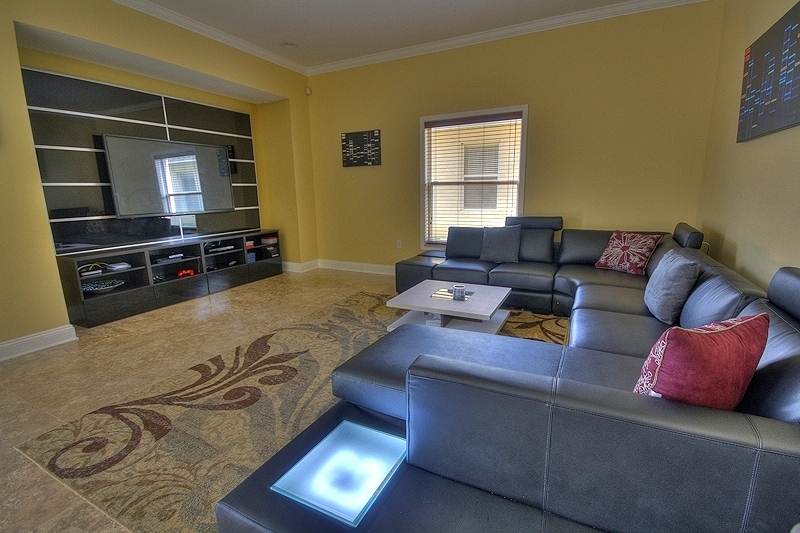 The main living room includes a 60′ LED TV with PS3 Blu-ray and 100′s of HD channels. Video games library and movies are included. Wi/Fi throughout the villa and pool areas at broadband speed – 10Mbs. Free unlimited calls to anywhere in Canada and the US. 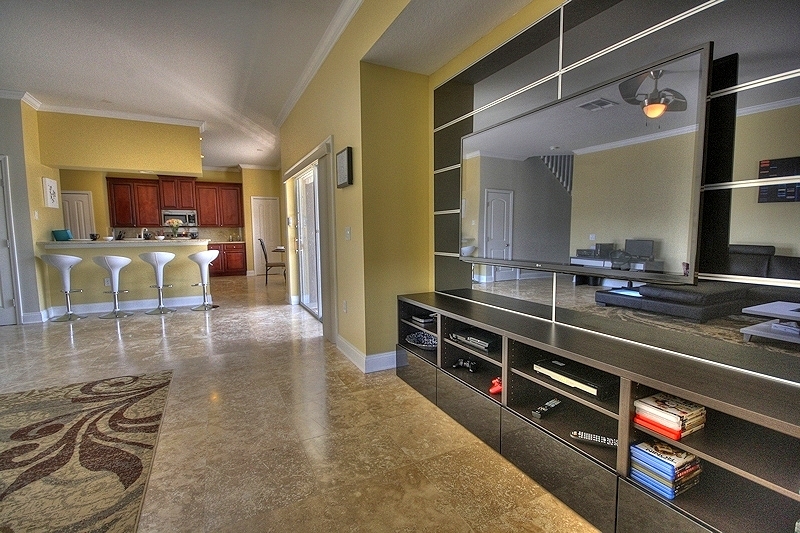 Gourmet kitchen with granite countertops and top of the line brand new appliances. Dining room with seating for 8 and separate reading area. Master bedroom has a queen size bed and 42′ Plasma TV with en suite bath. Second Master bedroom includes a queen sized bed and 42′ LED TV. Third first floor master includes a queen sized bed and 32′ LED TV. 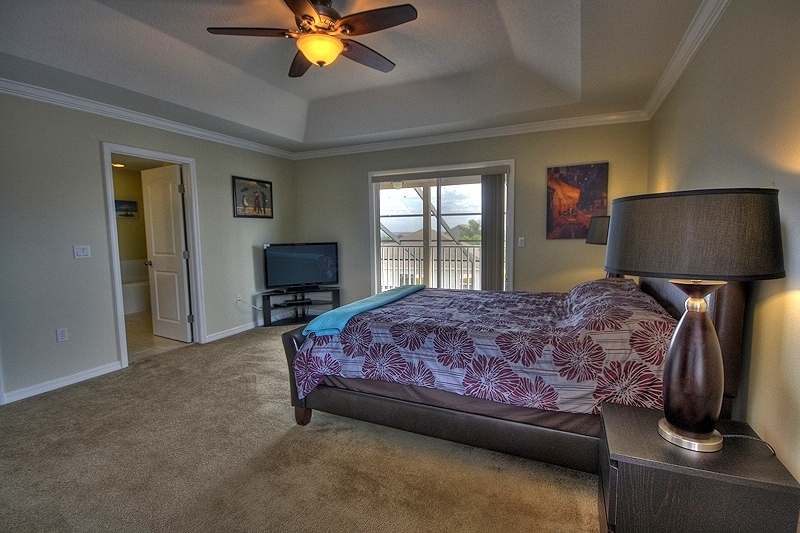 2 bedrooms include matching twin beds, ipod/ iphone alarm clocks and 32′ LED TVs. 6th bedroom includes a Queen size bed. All bathrooms are fully appointed and have granite counters. Brand new washer and dryer. Private games room is fun for the whole family. Two story screened in lanai with florida privacy glass is the perfect place for a BBQ and swim in our solar heated pool and spa after a long day of theme park hopping or golfing. Shopping is just minutes away with grocery and retail stores, world class outlet shopping as well as many restaurants and pubs. We are only 20 minutes away from Universal Studios, The Wizarding World of Harry Potter, Sea World, Wet and Wild, Lego Land, 45 min to Busch Gardens, Tampa, 50 min to the Gulf beaches, 1hour to Daytona beach and the space coast, NASA, Cocoa Beach. 20 golf courses within 20 minutes. This property truly has everything to make your Disney vacation or Golf getaway a dream come true. Beautiful property. This home was very clean, and conveniently close to all necessities when renting a home. Restaurants, gas stations, pharmacies, grocery stores, beer/wine/liquor stores. Beautiful and safe neighbourhood (gated community) our trip to Disney was extremely memorable and it all started and ended with this home. West Haven is an exclusive gated community less than 10 minutes to Disneyworld near Champtions Gate, home to 2 PGA Golf courses designed by Greg Norman. 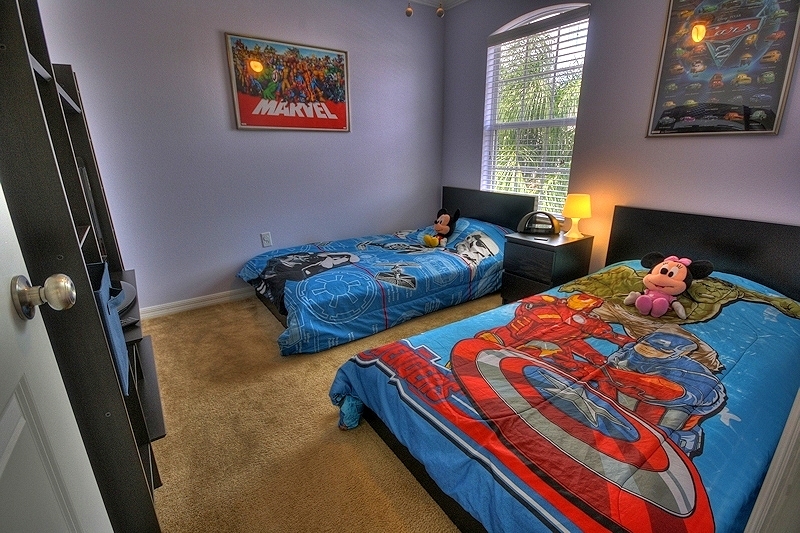 The property is only 20 minutes away from Universal Studios, The Wizarding World of Harry Potter, Sea World, Wet and Wild, Lego Land, 45 min to Busch Gardens, Tampa, 50 min to the Gulf beaches, 1hour to Daytona beach and the space coast, NASA, Cocoa Beach. 20 golf courses within 20 minutes. This property was fabulous! Everything that is stated in the description and photos is exactly what we found when we arrived. The property is in a great location, in a beautifully maintained gated community. Plenty of space, lovely and clean and furnished to a high standard, homely and comfortable. 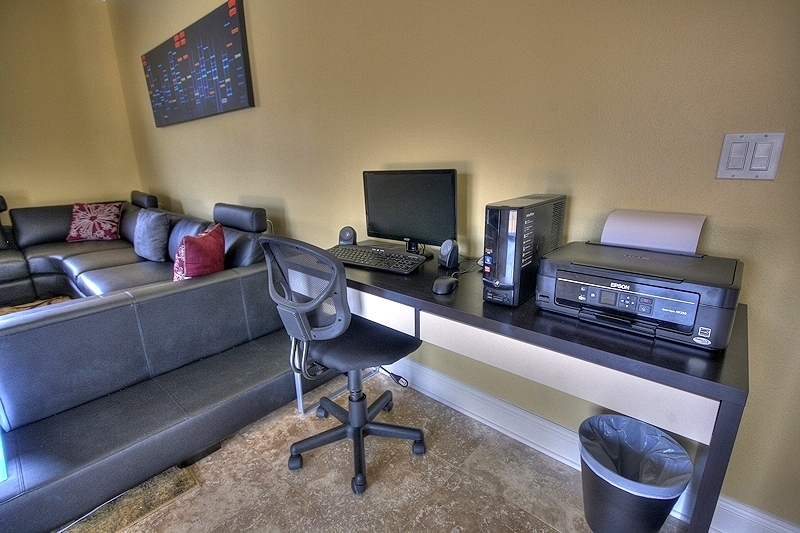 The location is perfect for everywhere your likely to want to go in Orlando also. We will definitely be back!! Vijay the owner made the whole process from booking through to arrival easy, answering any questions we had along the way. My son left his Harry Potter wand in the villa and he only realised when we got back to the UK. Vijay arranged for it to be shipped back to us... How good is that! We would have no hesitation in returning to this Villa it helped make our holiday even more magical. Thanks Vijay!